The Reptilians as they have become known are a staple of both science fiction and conspiracy theories. They are generally portrayed in popular culture as a race of humanoid creatures that evolved from reptiles rather than mammals. Either they will be aliens from another world or they will have left this world many years ago and now be returning to our world, or perhaps they will be living underground somewhere waiting for their chance to take over. The Reptilians are also generally portrayed as thinking of humans as vermin at best and a food source at worst. They are also often shown to have a group of humans that they have enslaved and generally mistreat torture, eat, experiment on too. They will also often be shown to be able to infiltrate our society through shape shifting or some clever form of disguise, which is probably why they have become such a favourite of conspiracy theorists as there is often a real sense of “they walk among us” in stories about the Reptilians. Some stories about the reptilians however may portray them as more sympathetic creatures with a culture different to ours, but no more evil or good. In this article I will look at how the Reptilians have evolved over the years across many different mediums as well as the real life conspiracy theories about such creatures. The Treens are possibly the first ever example of the reptilians from a science fiction perspective in popular culture. Prior to the Treens the only known examples of reptilian humanoids were in the works of fantasy authors like HP Lovecraft. It is believed that the first ever story to feature the Reptilians was the story “The Shadow Kingdom” published in 1929. It was written by Conan the Barbarian creator Robert E Howard. The villains in this story are said to be serpent men who have the ability to take on human form through magic. This classic adventure obviously laid down the template for many other stories that utilized the idea of lizard men living among us in secret, but where it was different to later works like V and modern conspiracy theories was that it was more of a fantasy story, with the serpent men using magic to look like us and being more comparable to creatures like Dragons. The Treens mark the first time such creatures were really brought into a sci fi environment and depicted as a race that could theoritcally evolve rather than a total fantasy beast like a Dragon or a Vampire. 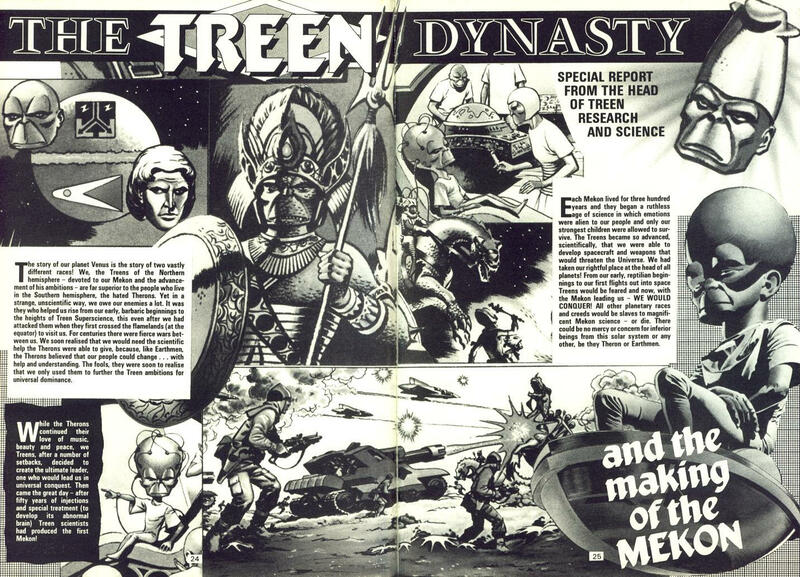 The Treens were the main antagonists of the British sci fi comic Dan Dare. They originally came from Venus and had evolved on the other side of planet away from their human like neighbours the Therons. The Treens evolved from Reptiles and lived among gigantic Dinosaur like creatures. They were shown to be highly aggressive and vicious and primitive compared to the Therons. When their neighbours first came to them in peace, the Treens attacked the Therons and slaughtered them, taking the Therons technology for themselves, they cannibalised it and became highly advanced creatures. They later tried to conquer earth but the Therons intervened, though Atlantis was destroyed as a result. The Treens would later create a leader called the Mekon who was all brain to lead them and would try and conquer earth and other worlds many times. The Treens embody many of the tropes that the reptilians would have in subsequent works. They are depicted as being evil, vicious monsters in contrast to the perfect human society that Dan came from, and also the more benevolent race of human like aliens the Therons who aided mankind against the Treens. The Treens were also shown to have a race of human slaves. The Atlantines. These were humans that they abducted during their first visit to earth. They generally mistreat the Atlantines and use them for experiments or as an expendable workforce. Their appearance even is something of a template for subsequent Reptilian races. They look like us except they have scaly skin and no hair and somewhat longer faces. As you can see the classic reptillian look really comes from them. The Treens not only brought the idea of the reptilian into a science fiction environment, but also really cemented the idea of them as total monsters too and thus for a long while after the Treens, the Reptilians would generally be go to guys for a villain in sci fi. 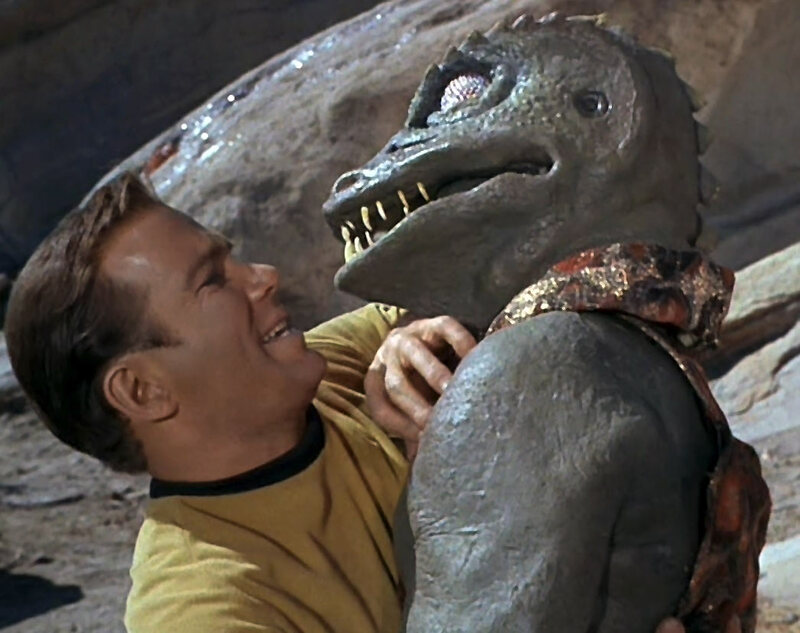 This episode of Star Trek the Original Series called Arena depicted Captain Kirk in battle with a giant lizard man named a Gorn. 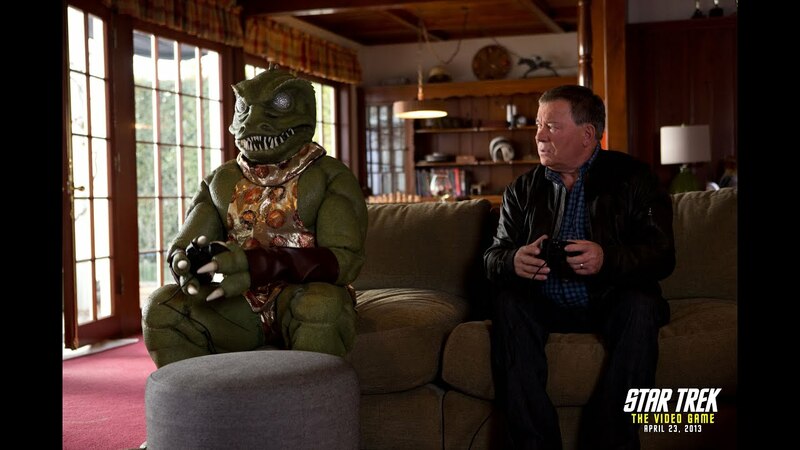 The Gorn slaughtered an entire Federation colony and a highly advanced almost god like alien decides to pit the captain of the Gorn’s ship against Kirk in order to sort out their differences. This marked the first time that we had the Reptilians being presented as a race that deserved to exist just as much as we did. Though the Gorn are the villains of the piece they are not just evil, warlike creatures like the Treens. They attack the Federation only because the Federation had unknowingly taken one of their colonies from them and at the end the alien does have some sympathy for the Gorn telling Kirk that one day the two races may be able to live in peace. Who says the Reptilians would be our enemies? In the 1970 Doctor Who adventure “Doctor Who and the Silurians” we are introduced to the titular monsters that are a race of reptilian humanoids who lived on the earth millions of years before man during the time of the Dinosaurs. When a disaster threatened to wipe out all life on the planet the Silurians hid underground in suspended animation for millions of years. When they awaken they are horrified to see that mankind has taken over and plan to exterminate the apes and reclaim their planet. Much like the Gorn the Silurians were presented in a more sympathetic light. They had a more advanced culture than ours, and they simply wanted to reclaim their own planet. There are also shown to be many Silurians who wish to help humanity and even live in peace with us, with one Silurian in the revival Madame Vastra actually marrying a human female. However again much like the Gorn the Silurians are generally portrayed as villains when they appear. What really helped them to stand out from previous Reptilians was the way that they along with their aquatic cousins the Sea Devils were here first. Thus in a nice twist the reptilians had more of a genuine claim to this planet than we did. Once again this would become a theme in subsequent stories involving the reptilians. This also marked the first time the Reptilians were actually linked to prehistoric earth reptiles. The Zygons were alien reptiles that managed to infiltrate our society through shapeshifting. They were extremely hostile and sought to exterminate humanity. Though they only appeared in one story they nevertheless became among the most iconic monsters in the shows history. They are even the favourite monsters of Tenth Doctor actor David Tennant. The Zygons mark possibly the first Reptilians who change shape and actually disguise themselves as humans and even politicians and figures of authority. This would obviously be reflected not only in later stories about the Reptilians but also in actual conspiracy theories about them too. The Zygons would return in the revival a few times, including in the 50th anniversary story. Their latest appearance in the the two parter The Zygon Invasion/The Zygon Inversion established that there were several million Zygons living among us disguised as humans. However in quite a nice inversion (no pun intended) of this old trope these Zygons are peaceful creatures who genuinely wish to live in harmony with us, with one of their number Bonnie now working at UNIT to help protect mankind from other threats. Cutest Reptilian (whichever one it is) ever! Without doubt the most iconic Reptilians. Though many of the tropes and characteristics associated with the Visitors in this series had appeared in previous works, this really brought them to the fore like nothing before it. I think part of that was down to the fact that this was the first series to actually focus on the idea of reptillian aliens. Before they had only been guest stars. Even in Dan Dare whilst the Treens were the most recurring enemies of the Pilot of the Future, he still faced plenty of other monsters and villains. With V however the focus was entirely on the Visitors and their plans for us. The Visitors came from a far away galaxy and came disguised as human beings. They were not shape shifters like the Zygons, instead they wore fake human skins. They claimed to want to help us, but secretly they wished to harvest mankind and all other mammal species on earth as a food source. They enjoy eating little furry mammals alive and guzzle human blood down by the barrel. The Visitors would go on to inspire dozens of other similar creatures in genre series. The Slitheen in Doctor Who were inspired by the Visitors. They too are large reptile men who hide under human skins, taken from people that they flay alive! They also inspired the Leviathans from Supernatural. Though the Leviathans are a non science fiction example. They are still basically the same idea. A race of reptile creatures that disguise themselves as humans and seek to eat us. A Visitor from the remake of V top, and a Leviathan from Supernatural. The Visitors also inspired the Martians in the television sequel to the 1950’s War of the Worlds adaptation who similarly hid in human bodies and tore their victims apart. In addition to inspiring other works of fiction about similar Reptilian beasts, V’s popularity also helped to give way to many conspiracy creatures that there were reptile men living among us in secret and planning to eat us! Its certainly after V that these conspiracy theories become much more numerous and well publicised. Babylon 5, one of the greatest and most accomplished science fiction series ever made managed to come up with a really fresh and interesting take on the Reptilian idea. Here the more Reptilian race, the Narn were the victims. Throughout Babylon 5 they are persecuted by the human like Centauri. Prior to the start of the series the Centauri had conquered and ruled the Narn for many years. The Narn had finally managed to drive them off, but now seek revenge by exterminating the Centauri completely and utterly. At the start of the series we are led to believe that the Narn are going to be the villains. The Centauri seem like old washed up has been’s whilst the Narn are in comparison the upstarts hungry for vengeance. As time goes on however the Narn end up biting off more than they can chew and the Centauri launch an attack against them with the aid of the Shadows and conquer them once again. Though this second conquest of Narn by the Centauri was not as long, it was far more brutal. Their invasion of the planet alone is utterly horrific. They conquered Narn using Mass Drivers, illegal weapons that actually managed to bring down asteroids onto the surface of the planet and shattered its cities and entire infrastructure to pieces. Billions of Narns were killed in this attack alone and N’Toth a Narn who witnessed the attack later described it as being as though the entire universe had turned against them! The state of the Narn’s home planet after the Centauri’s attack. It was once a beautiful paradise and is now a desolate, ruined wasteland. After the Centauri subjugate them they install laws that state that every time 1 Narn kills a Centauri, 500 Narn will be executed. They also round them up into ghetto’s and death camps and experiment on them to try and remove aggression from the Narn race. 100’s of Millions more Narn die in these experiments and whole communities are completely wiped out. Its just such a wonderful inversion of the usual humans vs Reptilians idea. We had of course seen more sympathetic Reptilian characters like the Silurians and the Gorn, but even they were not like the Narn. 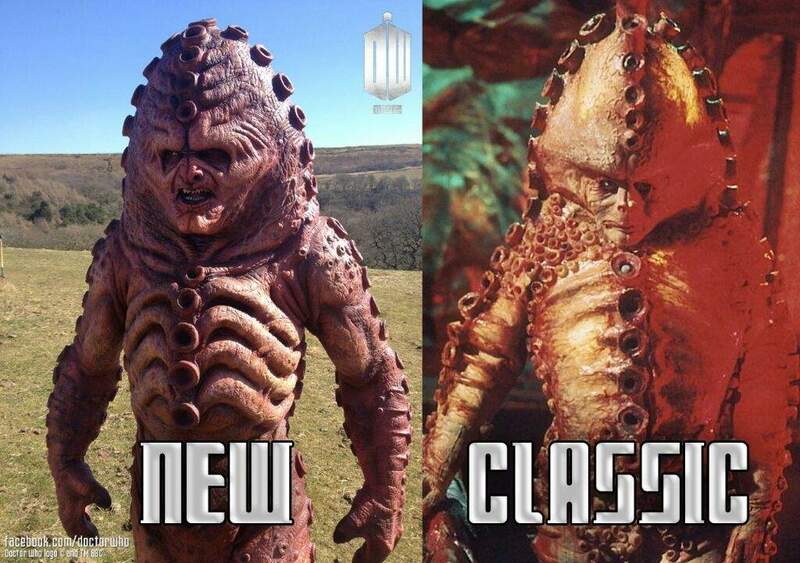 The Gorn, the Silurians and even the Zygons from the latest series 9 two parter were all still the aggressors. They were also the ones in a position of power. We saw the Silurians capture and experiment on people, the Zygons vaporize them, the Gorn destroy a whole federation colony. Thus whilst we do get to see more complex characters like Bonnie the Zygon or Vastra ultimately these Reptilians are still shown to victimize humans. With the Narn however we have Reptilians getting victimized by human like aliens and it just looks so odd. To cheer on the reptilian character helping to free his people from the oppressive human aliens was a great new take on what was by this point a fairly well worn cliche. In many ways I view the Narn/Centauri conflict as being a reversal of the Treen/Theron conflict from Dan Dare decades earlier. I am not saying it was intentional. It could have been for all I know, but regardless that’s how I view it. The Treen/Theron conflict sees two races one called the Therons who greatly resemble us and even view us as their kin. The Treens meanwhile are reptiles who are naturally violent and aggressive. The Therons try to help the Treens using their advanced technology. The Treens seeing how peaceful they were took advantage of them and managed to steal their technology and drove them out. They then became a space faring race and conquered other planets, an subjecting their people to brutal treatment. The Treens later conquer both the earth and the Therons who both eventually manage to drive them off. The Narn/Centauri conflict sees two races the Centauri who resemble us greatly and feel a certain kinship with us. Indeed when the Centauri first met humanity they believed that they were an offshoot of their race. The Narn meanwhile are reptile like creatures who are actually quite peaceful. The Centauri occupy them and enslave them and treat them brutally for decades. The Narn eventually banish them and steal their technology and use it to conquer other worlds. Eventually however the Centauri manage to conquer the Narn once again and treat them with the utmost brutality. You can see how the two stories have very strong similarities yet are polar opposites to each other. Both have a race that is like us and feels a kinship with us meet a less advanced race that is reptilian. The reptilians then steal technology from the human aliens and use it to not only fight them, but conquer other races. The big difference is that the reptilians in Dan’s case were always a brutal and war like race, also the human race in Dan’s case were peaceful and only wished to help the Treens who took advantage of them. 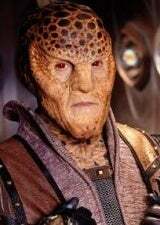 In Babylon 5’s case the reptilians were peaceful, whilst the human like race of aliens were aggressive and war like and they took advantage of the reptilians. Whilst both the Narns and the Treens do go on to become warlike races, the Treens manage to conquer the human like race that made them whilst the Narn’s are once again conquered themselves. Thus in the Treen storyline we see the reptilians enslaving humans and human like aliens and rounding them up into death camps and treating them no better than animals and the humans like Dan make big rousing speeches about never giving up, whilst in Babylon 5 we have images of human like aliens rounding up aliens who look like orange Treens into death camps, treating them no better than animals and Reptilians like G’Kar going into big rousing speeches about how they will never give up. The opposite of V, Dan Dare, the Silurians and the Zygon Invasion. Also what’s interesting is how the humans themselves are portrayed in both cases. In Dan Dare the humans are the heroes who beat the evil, cowardly reptilians whilst in Babylon 5 though there are humans who help the Narn, most of them keep out of the conflict and allow the Narn to be butchered. Thus to me whether its intentional or not the Narn/Centauri conflict is an excellent reversal of a classic sci fi story. Of course even if it were intentional I am not saying that would make Babylon 5 derivative of Dan Dare. At the end of the day nothing is original, but whatever the case I think Babylon 5 gave us a great new twist on what was again by that point certainly a very old, well worn story. 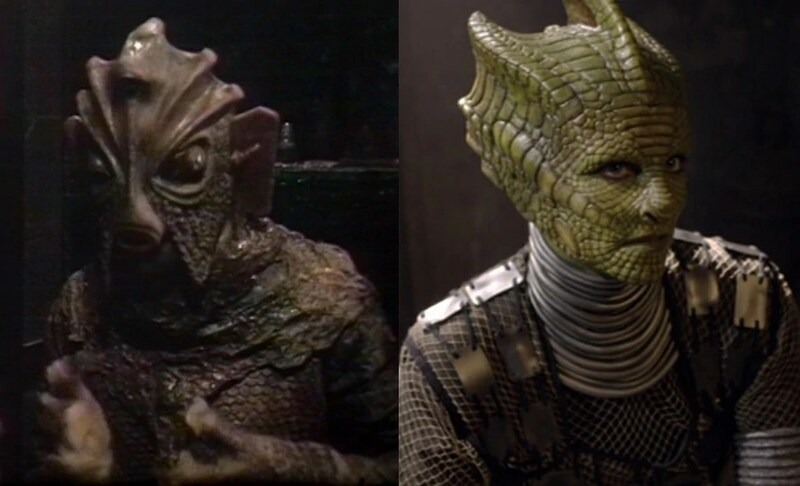 The Narn I think led to more reptilian creatures being presented in a sympathetic way as it showed that they didn’t always have to be villains like the Treens or even misguided villains like the Silurians. They could be the out and out victims too that we root for over human looking aliens. Its worth noting that the Narn are said to have some characteristics in common with mammals such as marsupials and feline’s too, but by and large they are shown to be reptilian in origin. 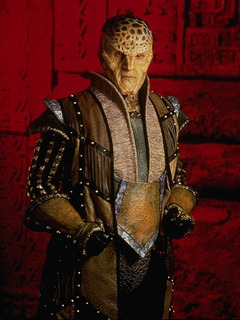 Babylon 5 also had another more sympathetic reptilian race of aliens called the Drazi who in contrast to say the Treens and the Silurians are shown to be particularly sympathetic towards human beings, being one of the few races brave enough to help them during the Earth/Mimbari war. Babylon 5 with both the Narn and the Drazi completely reinvented the reptillian cliche and brought something new to the old staple. Futurama gave us quite a funny send up of the Reptillian creature in sci fi with the Omicronians. The Omicronians are large reptilian monsters who seem to have a love hate relationship with humanity. They adore human television and other forms of entertainment, yet they also have been shown to be willing to exterminate the entire human race over not being able to see the last episode of an earth show. Like the Visitors in V, they are shown to enjoy eating human beings and drinking their blood, and they are also far more advanced than we are too like many reptilian races in science fiction. At the same time one episode The Problem with Popplers actually casts them in a sympathetic role like the Narn or the Silurians. Here the humans unknowingly consume billions of their children which they believe to be a tasty snack. I felt this was quite a good parody of both V and Babylon 5. Here we had the reptiles being eaten by the humans which was a nice little reversal of V, yet at the same time we have something that was actually horrific happen to the reptilians like in Babylon 5. However whilst Babylon 5 made us feel sympathy for the lizard men, here its presented in such a flippant humorous way you can’t help but laugh, such as when Zapp Brannigan is eating the Omicronians young whilst negotiating with them! Overall the Omicronians were quite a nice affectionate send up of an old sci fi character that first begun with the Treens over 60 years ago. Incredibly enough there are people who actually believe that the Reptilians exist. 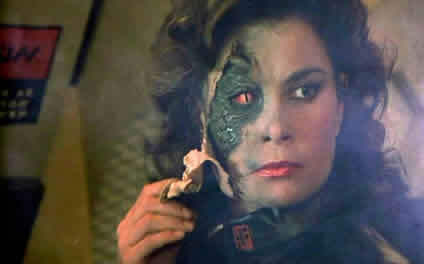 There are stories from those who have been abducted by aliens who claim that their kidnappers were reptilian in nature. 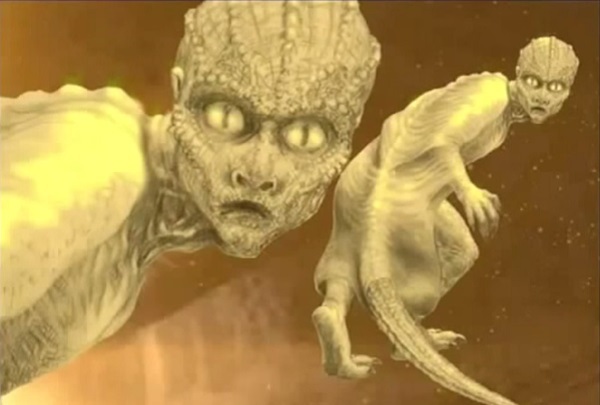 By far and away the most famous Reptilian conspiracy theory however is that proposed by David Icke which states that there are several Reptilians between 5 and 12 feet tall from the Alpha Draconis system. He says they drink human blood and can shape shift and that most of our world leaders are actually Reptillians in disguise, including Queen Elizabeth the 1st and George W Bush! He also believes they have a secret base underground. As you can see Icke’s Reptilians tend to bare a resmbelance to many famous Reptilians from popular culture such as the Zygons and the Visitors. Icke’s theory for such a wild idea actually has a lot of support. It has supporters in up to 47 countries and a 2013 poll showed as many as 4 percent of registered voters in America believed it to be true! I obviously don’t think its true, but I do find it an interesting theory in a crazy kind of a way anyway, but no I don’t watch V as a documentary I must admit.